Because I am a DIYer at heart, creating new and unique ideas to wrap gift packages has always been a hobby of mine. In the past I have played around with using paper flowers, felt creations, and tissue paper designs as gift toppers, but here is a completely new way dress up your packages. 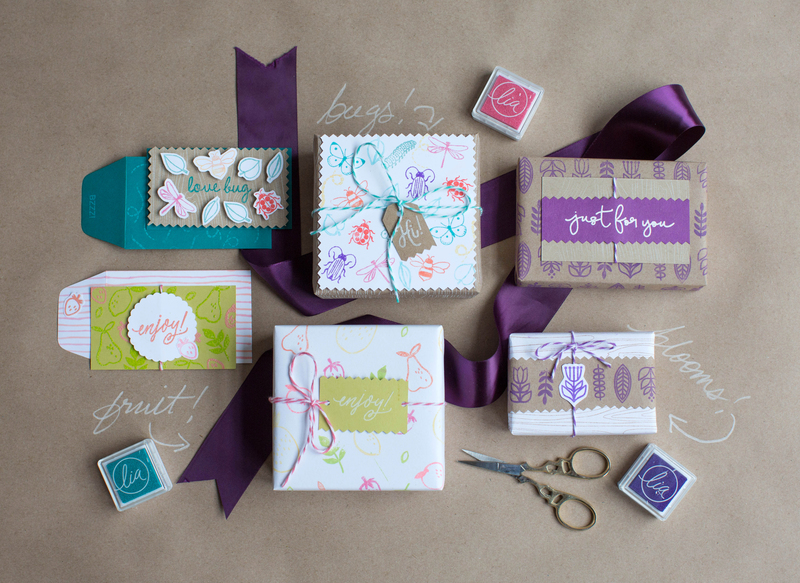 Creating DIY gift wrap is a cinch using my spring line of stamps that I designed for Hero Arts! I am so excited to reveal this spring stamp line with all of my favorite fruity and floral inspirations. And it is so easy to customize your gift wrap and tags with them! I started by gathering all of my favorite jewel-toned and pastel-colored ink pads, and then picked out some matching baker’s twine. You can of course use the stamps to add a personal touch to your favorite gift wrap pattern, or you can create your very own DIY gift wrap by using blank sheets of regular white printer paper or kraft paper. I have designed these stamps using various themes, so choose a set that complements the occasion or the person receiving your gift. Going to a summer housewarming party? Try my fruity set with pears and strawberries! Or how about going with a pretty floral pattern for a Mother’s Day gift? I personally love the idea of using the sweet ice cream stamp set for a kid’s birthday party. You can browse through the whole spring line, including my previous stamp collections with Hero, by checking out my product page on their website! Because Hero Arts partners with lots of other talented designers and stampers, they decided to create a 2016 Catalog Blog Hop to showcase all of their stamping goodies. They are all wonderful, so check them out for even more inspiration! Next up in the Blog Hop is one of my favorite stamp designers Kelly Purkey. Browse her website to find her spring designs! So happy to be able to join your site. Am a avid crafter and I tried to learn the most of a can to teach adults and children with disabilities and people with illnesses free of charges.. 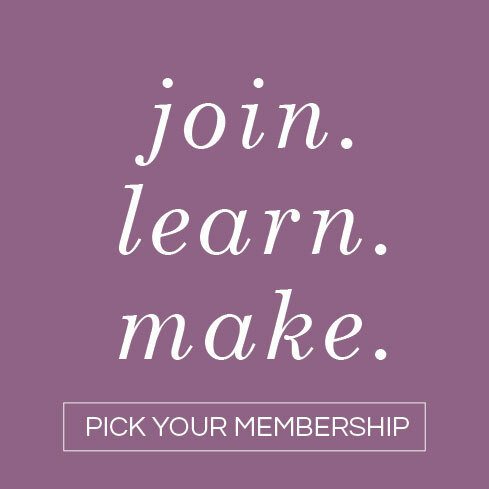 I took your craftsy class and I was amazed of how easy and elegant your crafts are. I will say that because of you I got my cricut air but I will need to go over your class a couple of more times. Also will like to know where to get your stamps, inks and other supplies. Thank you for sharing so much talent with us. Love the colors and fresh ideas for tags and decorating gifts- great fun! Thanks. I love to make tags! Cute ideas. Love when creativity and sensibility collide! Very pretty way to play package dress-up! A lovely idea! Great for keeping the kids busy! TFS Lia! It’s always great when you show the versatility of a product. Being adorable doesn’t hurt either. Thank you for creating such lovely stamps. I have your fruit set and I have made so many things with it already. And you ink cube sets make stapling on the go perfict. Our love that they coordinate so well. Can’t waitTo get my hands on your ice cream set. Your stamps designs are gorgeous, Lia. And I love the idea of custom gift wraps. I love to make my own gift bags and treat bags, but what a cute idea to actually make the gift wrap with stamps! So adorable! What great stamps, perfect for Spring! I love how you used them for the customized gift wrap – thanks for sharing! love the summery fruit collection! Wrapping paper is beautiful! Amazing packages, Lia, and I just adore your die tags with Hero Arts!! It doesn’t matter what’s inside, the wrapping & tags makes a wonderful gift in my eyes!!! Thank you so much for your kind words Larissa! Adorable! Thanks for the ideas for creating cuter packaging! The tag dies are my fav! Such pretty colors and what a great idea to make your own wrapping paper! You save money PLUS you get to stamp! Thanks for sharing, Lia. Really cute way to wrap a gift. Love it. WOW what a great idea, I know going forward I will have to do this how cute with these stamps! Thank you!!! Our days of using comic pages for wrapping and thinking that was original are over! What fun ideas and especially to use some of the smaller stamps. Really like the lady bug & grape colored leaves papers! Oh, Wow! What a great idea. I love your gift wrap! Thanks for the inspiration and for sharing! Wow, I have a whole new way to look at wrapping packages now. Love this, what a cute idea!! Thanks for sharing. I’m digging those cutout hearts and ornaments. very cute! Thanks for showing us. Love unique wraps and love creating them. Now I can go further by creating my own printed paper. Luv it. Thanks for sharing. Pretty color gift wraps. Your the best for doing paper crafts. Happy to get your ideas and tips. Thanks. So much fun!! Great ideas!! The best part of a gift is the wrapping! what a fun and stunning release! Very cute, I love making my own gift wrap also. Beautiful wrappings! They make the gift so much more special and so pretty. Thanks for sharing. All of your projects are gorgeous! I’m sure you put smiles on a lot of faces with those pretties! That is so kind of you to say, thank you!! Oh wow!! These are really cute. Great ideas for gift wrap. Oh I don’t know what to say, they are all outstanding and the lavender and green really stand out. Love everything. Thanks for sharing. Thank you for your kind words Linda!! OH Goodness! That puppy is so DOGgone cute!!! 8) I cannot wait to get my hands on it! Thank you, I am glad you like it!! Wow! Fantastic projects. Lots of inspiration. Thanks. So clever and cute! I love this! I am loving these ideas. Love the colors. Stamped wrapping paper. Need I say more. This is my first blog hop. It’s a very cool idea. I’m loving all the great ideas. Thanks! Wow!!! These are so adorable and pretty! What a fun way to dress up packages. Love all the different styles too. Like the wrap ideas. Like the bug stamping. Have a BEE-utiful day! 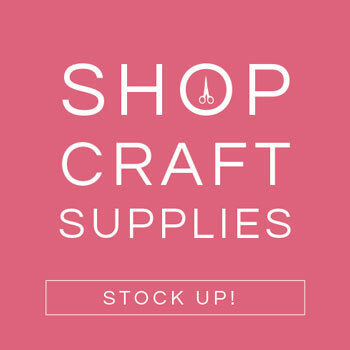 Your kraft paper stamped with purple is a total eye catcher. TFS. Thank you so much, I love how that one turned out! I too love DIY gift wrap. So much inspiration thank you for sharing! Thank you for all the great ideas for Mother’s Day! I really like your collection for the new Hero Arts catalog, especially the Floral Heart Stamp & Die. I appreciate your elegant, classy designs! I just recently introduced to your designs, using your Winter Cheer Tag set for my Christmas shaker card! Those colours are amazing! And I love the fruit. Beautiful stuff!! Love the spring colors and your gift wrapping!! I love to add special touches to my gift wrapping! Thanks for the inspiration! Where could I find the tags at? I love them. I made those gift tags using my designs and adding stamps from the collection 🙂 Feel free to browse the site for all the gift tags that I have! Thank you so much for the wonderful gift wrap ideas. I cannot wait to try them out myself. Thank you for such wonderful gift wrap ideas. Can’t wait to make some. How fun to make gift wrap! I’m going to have to get a second job! Too much awesome new stuff to play with! I love making my own wrapping paper and you’ve given me some great ideas! Oh good, I’m so glad to hear! Awesome-Awesomeness! Love your designs and projects! Such bright and cheerful wrapping ideas. Sure to bring a smile to any face. I love the accented brown Kraft paper wrap with the stamped trim! Beautiful. Love your ideas! Thank you! Love these. Great ideas. Thanks. The gift wrap is also a gift. Great designs and colors. What a totally clever idea! Great colors. Can’t wait to give it a try! Love your wrapping ideas–going to have to steal a few of your ideas! Simply amazing. Love all of it! What a cute way to decorate packages! Thanks for sharing. Wow what a great idea to decorate wrapping with your cute stamps! I also love those tags! This blog hop is going to be fun. I am learning so much from all of you. Awesome gift wrapping and new release! Lovin’ it! Yes, this is a wonderful activity to do with the kids! Love the take on stamping. It reminds me of some ideas from about 20 years ago. Thanks for reminding me. Lots of coolness in this new release! Can hardly wait to get my hands on some! I’m loving these inspirational posts! Can’t wait to see them all. Oh wowzer! I should totally start making my own present wrappera too! They are just so pretty and cute!! Love them so so much! Beautiful projects!!!! Love it! Thanks for sharing!!!! This is so cute and lovely! Great idea! Love the variety of stamps your line offers…something for everyone! I just love that bugs gift wrap! The possibilities are endless! Thanks for the inspiration! So many great gift packaging ideas packed into this post. I already had a wish list for the new Hero Arts release, but now I must have those bugs! Thanks for all the inspiration. You are so welcome, I am so happy to hear you are enjoying the collection! Wow – love your DIY gift wrap idea! Gorgeous packaging Lia! I love to make my packages as special as the gift inside and these definitely fit the bill. So darling! I love seeing all the ways to stretch our stamps! Now you’ve got me thinking beyond card making! I love the bugs………..and I hate bugs! Thanks for the inspiration. I love this lovely gift wrap. Thanks for sharing such a great idea. Love love love those gift pkgs and gift tags yummie yummie colors so beautiful thanks for your great ideas!!! Love love love the colors the tags the ideas so fresh and those tags what’s not to love! I want want want!!! Thank you for some beautiful ideas! Thank you for your kind words Dianne! I love your tiny floral images set. And your example in purple is amazing. Very cute ideas…love the color! With the snow outside…I’m wishing for summer too!! I am itching for summer!! Wow…just love your ides! The images are so cute! I love to add something extra to wrapping paper but you definitely took this to the next degree! Aweomeness!!! I got some of your inks from HA a few months ago and love them! The colors are so fabulous! Fabulous! Love it all Lia!!! Beautiful gift wraps to tags to EVERYTHING!!! Love these gift wrapping ideas and the adorable tags, too! Thanks for sharing those clever ideas! Wonderful contributions to the catalog! Super-cool die cuts … who would want to even open those presents … they are too cute. Your gift wrap is so cute and creative! I definitely want to give this a try. How fun! I never thought to use stamps to customize wrapping paper. Love it!! Yay, I am so glad you are feeling inspired! Cute projects! Thanks for sharing. Adorable stamps. Excited about hopping. I like the idea of making gift wrap out of Kraft paper. Cute idea. You did a fantastic job. Looks very professional. Great idea. I never seem to have wrapping paper when I need it. This release is adorable. Already bought some things! Wonderful! I am so glad you like the collection! I like the idea of making embellishments for gifts. Thanks fir the ideas. Very cute! I love all the possibilities. Your gift wrap ideas are always so tasteful and fun. Thank you for the endless inspiration! Love the dessert tags in the pastel colors. Makes me hungry for summer BBQ’s! The custom wrapping paper is such a cute idea, I can never find what I’m looking for in stores, but didn’t think about making my own! Making this gift wrap certainly made me wish for summertime! I love the color of your inks! I am new to your blog, so I will have to add you to my list! Thanks! These are so adorable! Love the stamped wrapping paper! I love your gift wrapping idea’s! And I can say, I so love your style of stamps! I love this idea, your packages look fantastic. I will definitely be trying this next time I give a gift! Thank you for the great inspiration! What a fun project…love parties. OMG ! Those gift wrapping ideas are fabulous!! those bug stamps are so ridiculously cute! Loovvee them!! Thanks for sharing the delightful ways to embellish gifts and wrapping. Love the die cut tags!! Fun cheerful gift wrap ideas! Fantastic projects! Such cute gift packaging! Great job! What a fantastic idea! I will defiantly be doing this for the next gift I give! Your packages look amazing! Wow awesome ideas. Sure would make any gift super duper presentable. Oh these DIY ideas are wonderful Lia! I enjoy your stamp and die cut design a lot!! Thanks for sharing! Super cute idea! I love the tiny stamps, and your color choices! Lia, your products and project ideas are AMAZING!!! Really like your blog too! 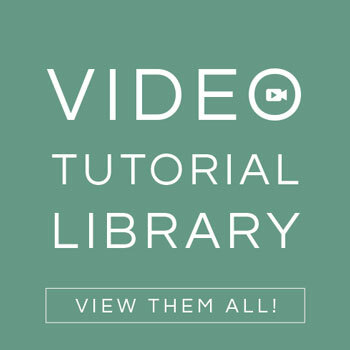 Great tips and techniques… THANKS for sharing. Such cute projects. Love the tags and the Love Bug card. TFS! Adorable, thanks for sharing these with us. Great ideas for gifts and packages. Thanks for sharing! Love Hero Arts! Love making my own wrapping paper. I love the colors I love the stamps! Very pretty!!! Thanks for the inspiration!!! So pretty! I always like seeing what you’re coming up with next! That one is my favorite too! So glad you are feeling inspired!! These are wonderful, creative ideas. I love that you can personalize the themes and colors. Great job! Such fun little gift containers. Thanks for sharing. Such a fun idea. Thank you for sharing. Super cute wrappings! Love this! that I embellish with stamps, paper, etc. These sets will look darling on the bags. thanks for the idea. Your presents are works-of-art. These are all as adorable as can be… I think I fell in love with purple and kraft today! Great ideas! Wonderful inspiration for gift giving. I am such a fan of yours, Lia. So glad you are working with Hero Arts, a company I have loved for years. Adorable wrapping ideas! Thank you for sharing! You did a beautiful job on the wrapping paper and a great idea for using the small stamps is always welcome. They some times get left in the sets and hardly ever used. Thanks, so glad you are find this post useful! Thanks for sharing these wonderful ways to make a gift special. Love your handmade gift wrap! Wonderful ideas, so happy and fun! I love your idea of creating wrapping paper with stamps! These are simply beautiful! Thank you so much for sharing your creativity. Cheers. So many cute projects. Thanks for sharing! Love all of your ideas for gift wrapping! Hero Arts stamps are awesome! Wow, these wrapped presents are gorgeously done. Love the idea of creating your own wrapping paper!!! I really enjoy your style and have several of your designed stamps and dies. Love using them. Decorating wrapping paper with stamps is my favorite. You’re designs are the cutest and love the dies! So versatile, thank you! Whenever I wrap gifts I also put so much into it, more than a lot of people that I know. Tags are definitely one of my things so this is great inspiration! I do wrapping paper too and love these here. Thanks for sharing. Beautiful wrapping, love the hart die too. This makes the OUTSIDE of a package as special as the INSIDE! Such fun and pretty ways to customize presents. Really like the mini inks. OMGoodness Lia these are amazing. Love them all, great work. Wow…are you kidding me? I could never do this but it’s on my bucket list. Hopefully you have a very detailed video somewhere and I might spend a week making one wrap. So uber fabulous!! Thanks!! Super cute! LOVE the bugs. It’s always fun to make gift tags. You have such clever ideas. I’m going to borrow them. How much fun! Seeing the expression on the receiver would be just as rewarding. Love the colors used. This brought back memories as I use to do this when my son was at school, (primary school), i would make a card for his friends and matching paper for their birthday gift ,it always went down a treat with his little friends and their mums too but definitely not a teenage boy thing lol. thanks for sharing. These are such cute new stamps–those florals are really calling my name!! Lia what a fantastic array of gifts and the pretty gift packaging and wrap! You did an amazing job personalizing these gifts in their own handmade packages and gift wrap. I love all the projects that you created and shared with us! Thank you so much for your kind words Jo, I am so glad you are enjoying the gift wrap idea! Correction….that was supposed to say…….you do great work. Oh my, I just love those bug stamps! The purple ones look particularly good, dress up a parcel beautifully. I love your entire collection! These are all adorable ideas! 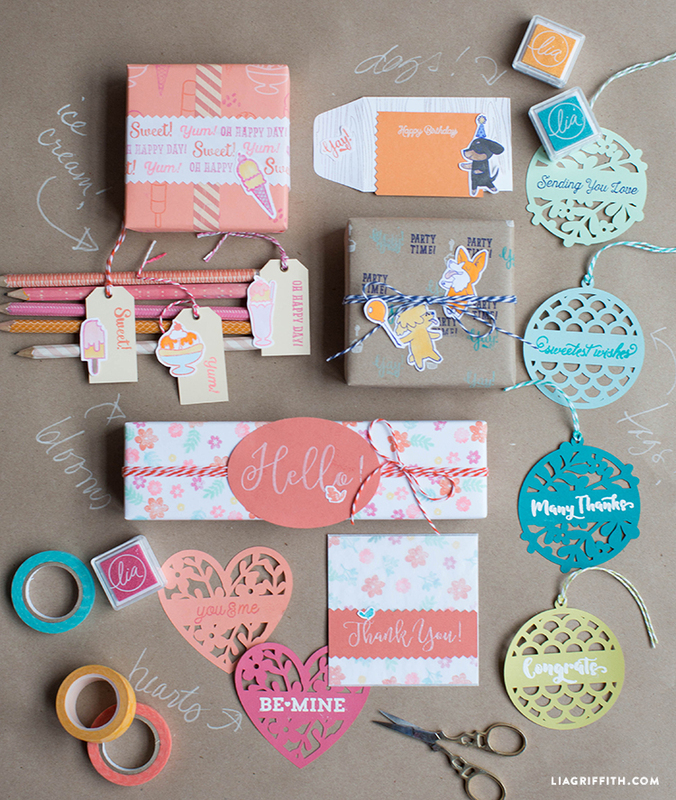 Love how you use the stamps and dies for wrapping and tags. Such fun. I needed the reminder! I am so glad that you are feeling inspired! simply gorgeous Lia. All of the little bits and pieces are stunning. Lia, these are just gorgeous! I love your line! Beautiful paper and tags. I love your work. 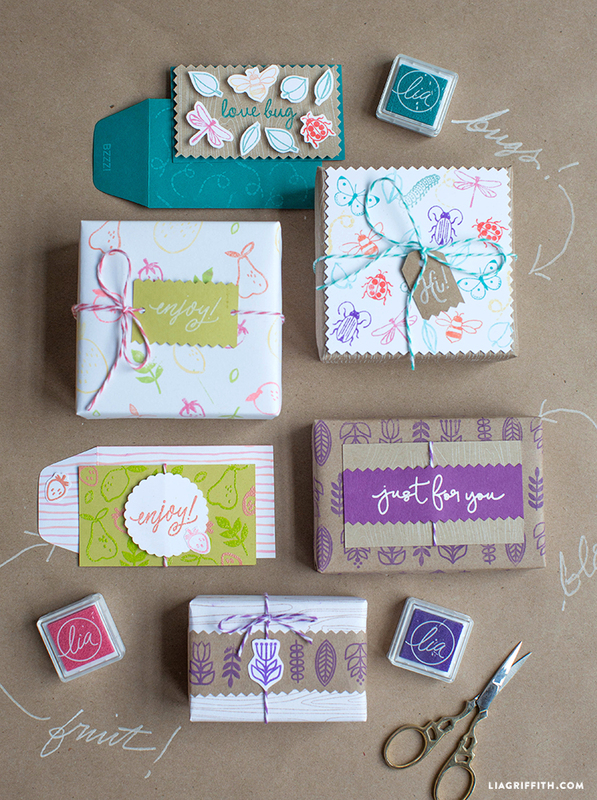 Such pretty gift wrap and a great way to use smaller stamps. Love the Party Animal poodle, she looks like mine. Gorgeous gift wrap ideas, love all the stamping, discuss and embossing, plus the embellishment details tie it all together! What a great way to personalize every gift! Thank you, I am so happy to hear you like them! Beautiful, fresh and inspiring! Thank you! So many cute and fun ideas. Thanks! What fantastic ideas for gift wrap! I can’t wait to try this myself. Can’t believe I never thought to do this! Oh my gosh! I love, love, love what you did! I used to stamp on brown paper when I was sending gifts to pen pals but I haven’t done it in a while. I may have to do it again. I want to really check out what you did and then check out the spring catalog and what you did. I have a feeling I will be cracking out the old credit card. Again, you did some really pretty and fun things. I want to try all of them! Thank you so much for your kind words Gail! Your products and ideas for gift wrapping are adorable! Just beautiful, Thanks for great ideas on what to do with those small stamps we have..
You are so welcome Barbara! I love your DIY decorated gift papers and tags! Fun ideas! This looks like a great release. Thanks for sharing! The giftwrap idea is great! Can you also stamp right on gift boxes, or is it better to stamp on paper? Love the awesome tag dies! Such fun ideas! Love how you created the gift wrap and those wonderful tags! Love the sweet treat stamps! Great ideas to make presents pop. I love all your projects. The open patterns you made are very cute. Purple and kraft is my favorite. These are just too cute! Great idea. Really great ideas for customizing gift wrapping and making it special and cute! Love the fruit stamps. Perfect for my gardening journal and tags. What a fun project for my grandkids to try! I love the intricate tags. What a fun idea for my grandkids to try! I do like the pears and strawberries, those are cute. And the leaves. Summer… did someone say Summer?! That’s what these stamps make me anxious for. Love them and great idea for the gift wrap! TY! They make me long for summer too! What fun ideas. Thanks for sharing! adorable gift wrapping ideas. . . .
What darling little packages. It must be so fun to use stamps that you designed. So many fun ideas. Thanks! Awesome inspiration to use my supplies and love the tags! Wonderful projects!!! Thanks for sharing! I love the party stamp set and also the bug one. Wonderful ideas for those gifts I have to wrap ! Fun is coming ? Lovely gift wrap ideas! I really love those die-cut tags. So many great ideas, I love to do different things for wrapping gifts. Okay, those bugs are AWESOME!! Ooohhhh! As a sewer and needlecrafter I love the new handmade tub kit. Your new products are delightful and great projects. Thank you for the inspiration, Lia ! What a great idea! Love how you used the stamps! SO SUPER CUTE! THANKS FOR THE IDEAS. Thank you for your sweet comment! I love that you hand-write your letters, I love that sentiment. People don’t do it enough anymore! I am a stamping fool and love paper…your ideas for decorating wrapping paper is right up my alley! I adore your new collection. I always forget I can use my stamps to create my own wrapping paper. Thanks for reminding me. Love the spring look of your sweet bugs and other sweets, especially in those yummy colours. YOU HAVE SHOWN US SOME GREAT FUN IDEAS FOR PACKAGES…. YOU WANT THE PERSON RECEIVING TO BE SURPRISED IN SUCH A UNIQUE WAY….THIS DOES THAT PERFECTLY. THANKS FOR SHARING!! You are so welcome, thank you for your kind words!! I absolutely love your designs. These new stamps are adorable. Can’t wait to see all your products on the Hero Arts website. I’ve been trying to make own gift wrap. Your creations are very colorful and oh so well designed. Love all the tags as well. Thank you so much Shirley! I am glad you are feeling inspired by this project! Amazing ideas, thanks for such great inspiration! FUN! Seriously, these just make gifts pop. I love it! Lia, your products are so cute! Who wouldn’t love getting a package decorated with one of your special die cut tags. Love all your products, especially the die cut heart! Gorgeous. Thanks for sharing some DIY wrapping ideas! You are so welcome, thank you for your kind words! Fun ideas. The open work dies are show offs. Awesome! I am so glad to hear you’re feeling inspired! I will make an occasional gift tag, but I don’t think of making wrapping paper too. You have inspired me with these beauties! Wonderful idea to create custom gift wrap. Well done! Your stamps are adorable! This is a great idea to use them this way. I love the colors too! Very nice concepts. Love them. Love the bugs Lia. I’ll be keeping my eyes open to see when they arrive on Amazon Canada. Hero Arts rocks! Wow! I love all the creative uses shown here for the Hero Arts supplies! The DIY wrapping paper is the next step beyond using hand-crafted tags and makes the gift even more special and unique! Great idea! These are truly amazing. I love your creations! Good ideas to personalize your gift wrap and even match the gift inside or the person the gift is for. That is exactly what I was thinking! A great and affordable way to personalize for the season or recipient! What a fun, cute idea!!! Love this!!! Love these little stamps! I always dress up my business cards with these. The little fruits and flowers go right to my wishlist! Wow, that is a great idea!! I had never thought about using stamps for business cards but it would definitely set you apart from the all those ordinary bland business cards! What a great idea! Let’s face it – some of our purchases leave us wondering why we bought them. Gift wrap is a new use. Thank you! What adorable spring stamps! Love the party animals. So fun! I love stamping on wrapping paper. Your packages look to pretty to open. I love, love, love the bugs! Such bright and fun packaging. Makes one hope a package is for them 🙂 Great ideas for packages. Thank you 🙂 It was so fun matching the gift tags and the stamps with the baker’s twine too! I love these little stamp sets! They are perfect for little cards, gift wrap and favors. There are so many possibilities. I adore those little “sweets” stamps. Are those Hero Arts? This inspires me to want to get time in my craft space and create!! Thank you for showing your craft. I really enjoy the stamping and embossing techniques. It is evident that you truly enjoy your love for everything paper, once again thank you for sharing. You are so welcome, thank you for your kind comments! Love this idea! Your gift wrap is gorgeous – I am filing this away in hopes of remembering to use it. Thank you! Not only is it really easy, but it was honestly really fun having a stamping afternoon creating all this lovely gift wrap! Beautiful gift wrap ideas! Love those awesome tag dies!!! !